It’s in Tralee, in St John’s Church – and it’s breathtaking! It isn’t often that new stained glass windows are installed in Irish churches. In fact, depressingly, many churches fall into disrepair from lack of use and the windows break (or are broken). 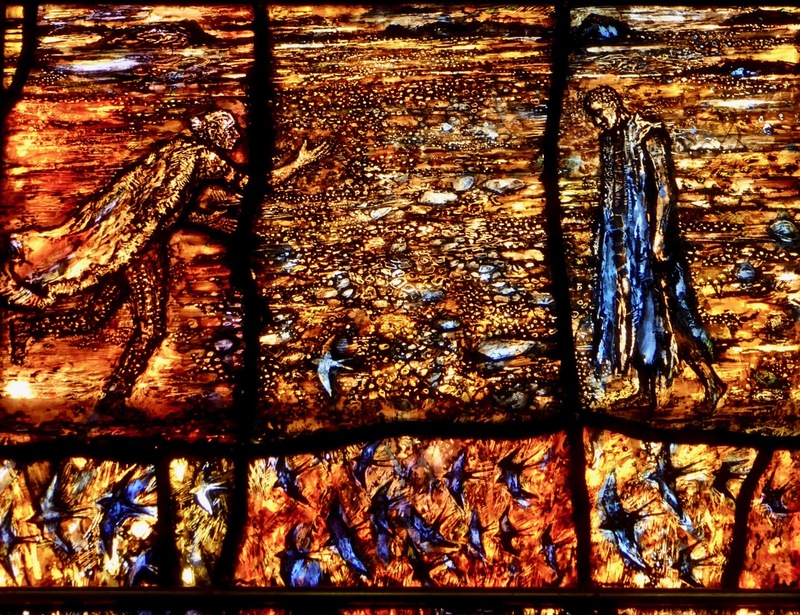 Nowadays we are more likely to be losing stained glass than gaining it. So it’s a huge cause for celebration when a community commissions a new piece. Hats off to Tralee! The theme is Reconciliation, and the central figure is the return of the prodigal son. The right panel is of Jesus reading from the Book of Isaiah and the left is of John the Baptist, patron saint of the church. 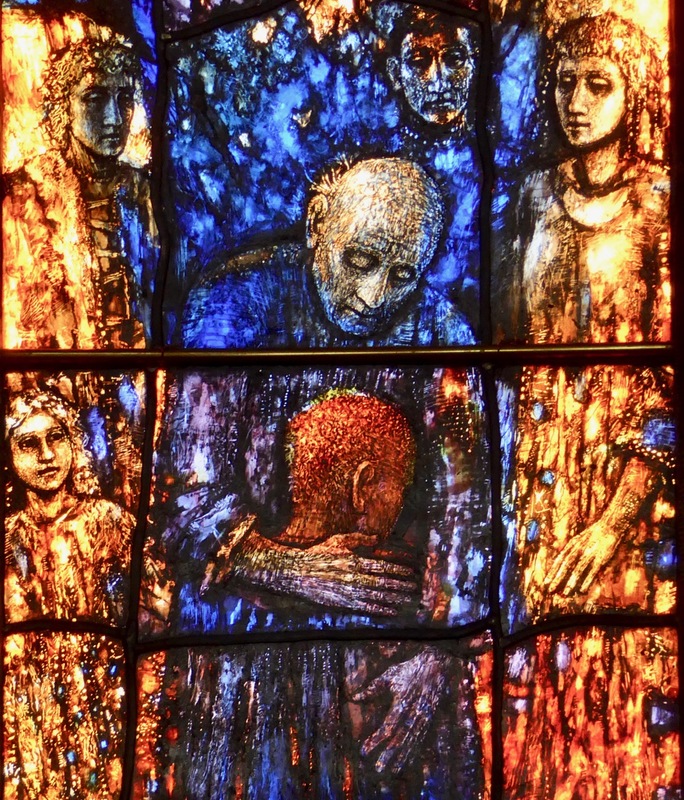 The Parable of the Prodigal Son is a natural choice to illustrate reconciliation, with the father embracing the son who has squandered his inheritance but returns home, contrite, to his family. Instead of punishing him (as his brother resentfully feels the father should do) his father embraces him, orders that the fatted calf be slain for a feast, and says, It was meet that we should make merry, and be glad: for this thy brother was dead, and is alive again; and was lost, and is found. Jesus Reading from Isaiah is perhaps at one remove from a direct reference to reconciliation. It happened in Nazareth, his old home town, and he read at the behest of the elders. The passage is a beautiful one and points to ideas of love and healing, and perhaps to the real purpose of Christianity, no matter the denomination: he hath sent me to heal the brokenhearted, to preach deliverance to the captives, and recovering of sight to the blind, to set at liberty them that are bruised. Possibly my favourite image is that of John. Usually, he is shown in the act of baptising Jesus, but here he is, the ascetic in his coat of camel hair, very much as he described himself, as a voice crying in the wilderness. 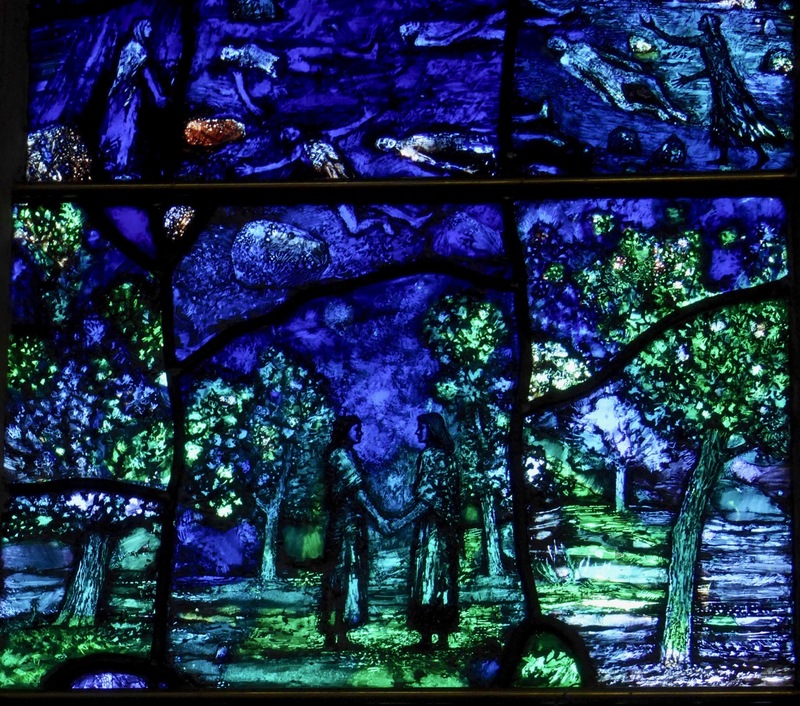 A myriad of tiny images fills the panels – figures holding hands (reconciliation), swallows (hope of spring, renewal), Tralee Bay, figures from Tralee history. . . there are even tiny names engraved where it is impossible to see them. Take a look at this video, where Tom Denny shows us some of those names. Tom Denny? 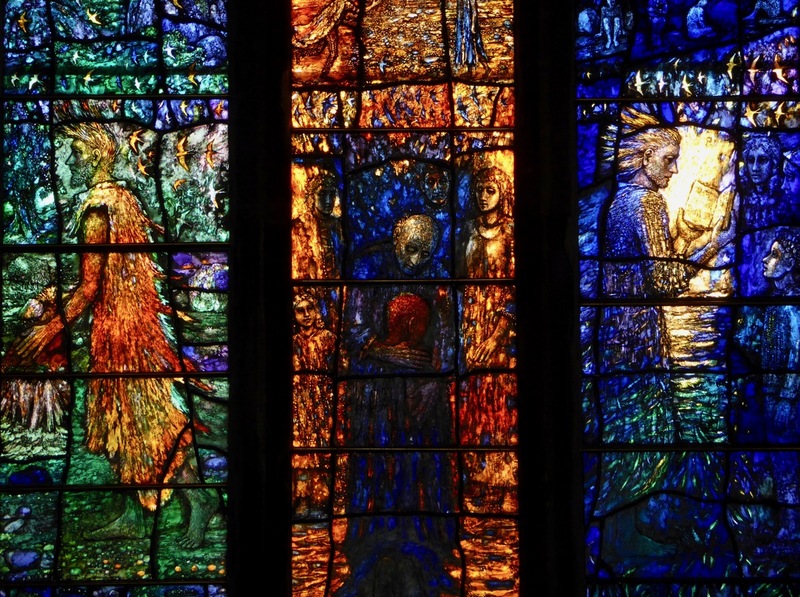 Yes – he’s the artist but the significance of that goes beyond the fact that he is one of Britain’s most eminent and respected stained glass artists, responsible for numerous windows in British churches. A browse of his website reveals the breadth and depth of his skill and the uniqueness of his style. 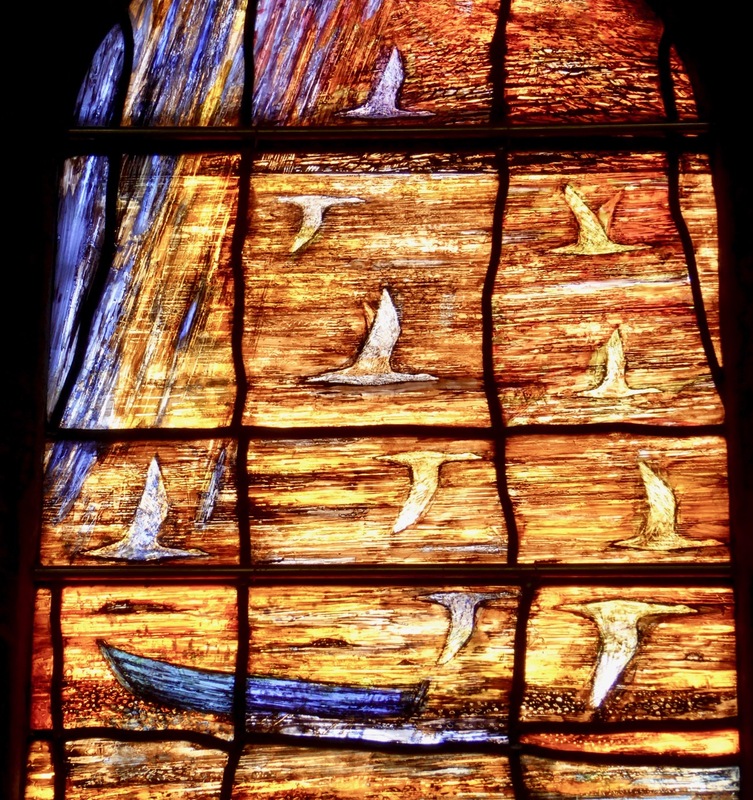 The Tralee windows are typical – blazing with colour, filled with large and small figures and scenes that reveal themselves upon close inspection, rich and intricate, thoughtfully composed to draw the viewer into the subject of the panels. You see, the Denny’s came to Tralee as part of a British military expedition in the 1500s and the name is inextricably linked with the North Kerry area. 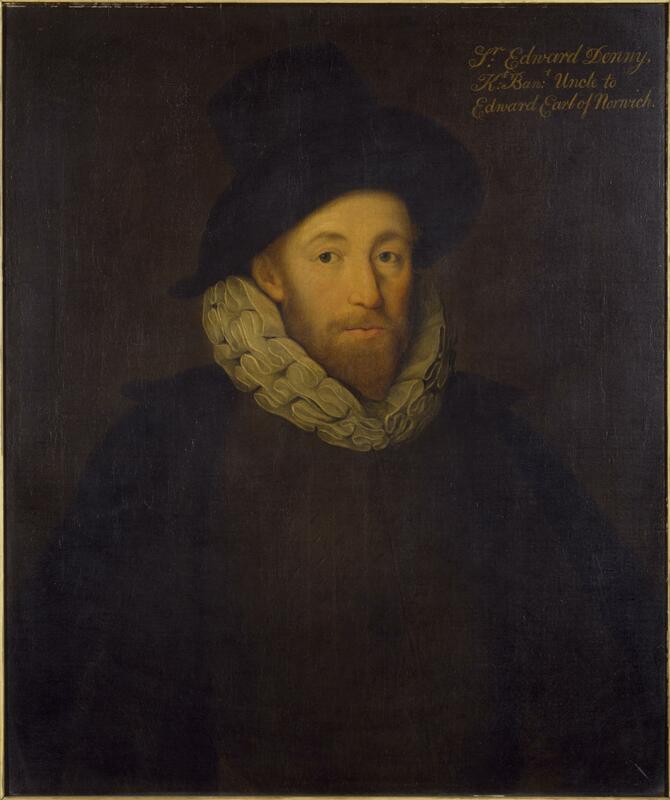 Sir Edward Denny (1547 to 1599) was one of the architects and enforcers of the Plantation of Munster, and was rewarded with lands taken from the Earl of Desmond including Tralee Castle, a knighthood and the title of Governor of Kerry. Tom is a direct descendent. The Denny’s stayed in Ireland for hundreds of years, branching out and acquiring land and estates. Eventually the family spent less time in Ireland and concentrated on their estates in Britain**. 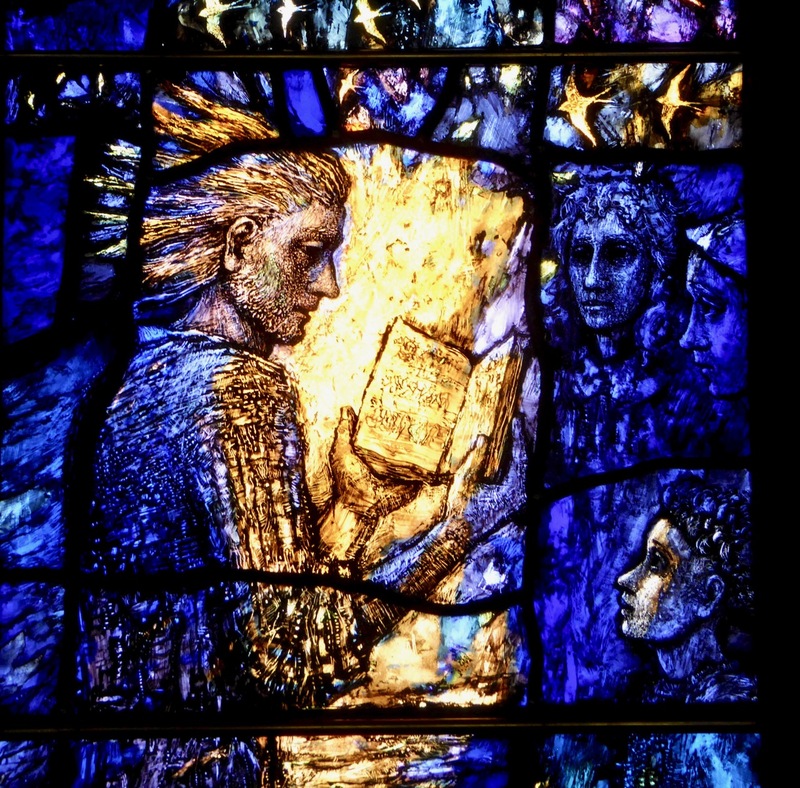 In Ireland, such a history as this is a complicated legacy, and Tom was eager to be part of the whole idea of a reconciliation window, donating his services to the project. Over twenty members of the Denny family came for the unveiling. 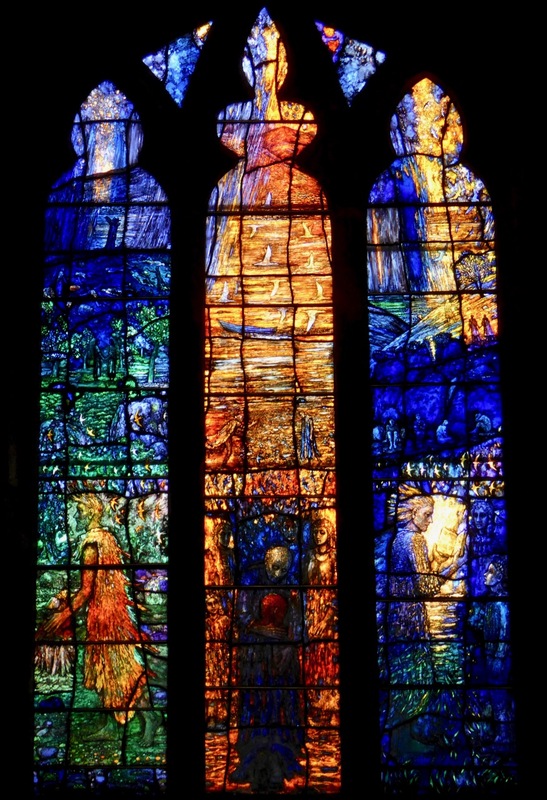 This adds a rich and poignant dimension to the purpose of the window – reconciling the past with the present, and looking to the future. Finally, this magnificent work of art is only one of the many artistic delights of this Tralee church. 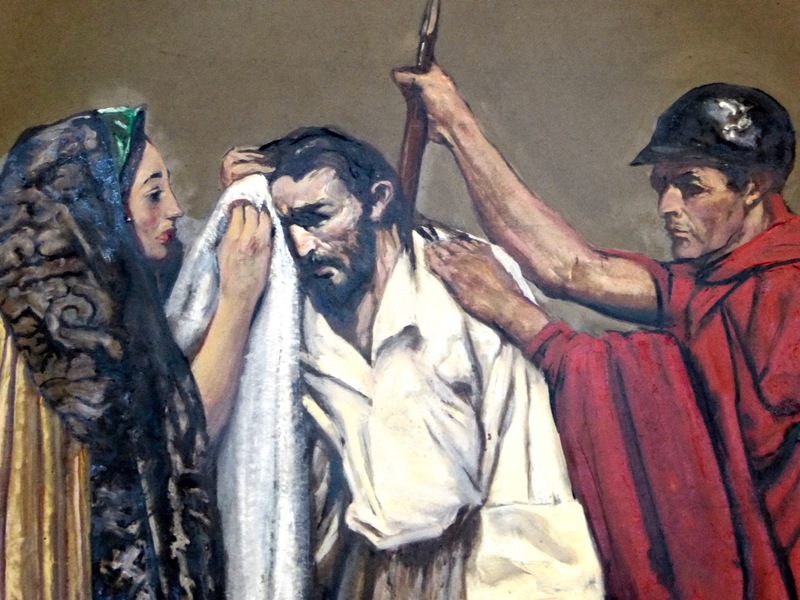 They deserve a post of their own some day, but I will give you a sneak peek by telling you that the Stations of the Cross are by none other than the famous Irish artist, Sean Keating. Here’s a detail from just one of them. My friend Eileen drew my attention to this new window. So thank you, Eileen – as you can see I lost no time in making the trip to see it. I am SO glad I did. **Edit: I got this wrong. There were no English estates. The Denny’s, along with many members of the Anglo-Irish landlord class, eventually lost their lands. 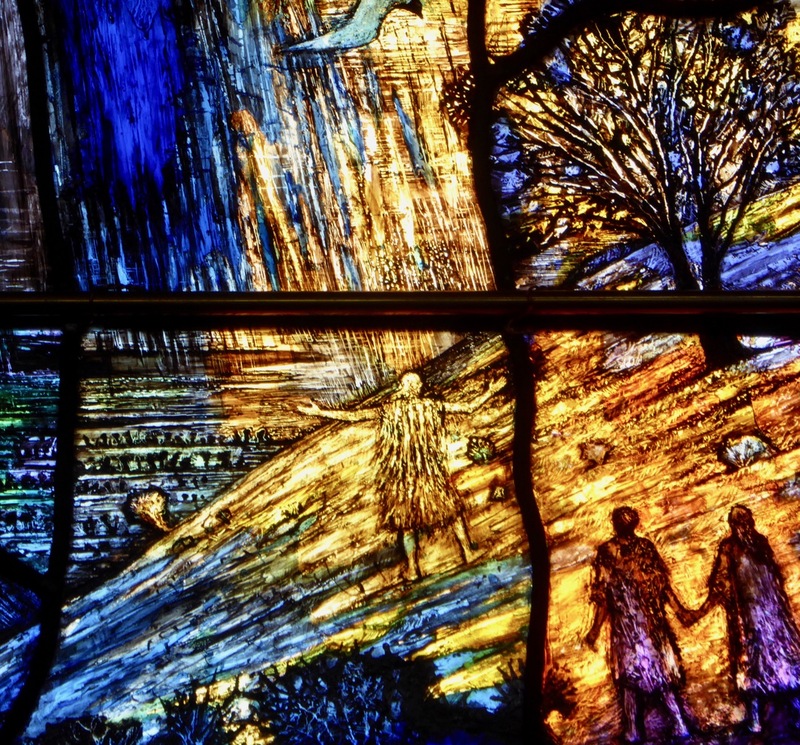 In the case of Tom Denny’s grandfather, although he was a baronet he was also a clergyman, living the life of an impoverished cleric dedicated to his church. The move to England was related to his church service. RTE has now screened their program on the window and it does a marvellous job of adding fascinating detail about the window and the history of the Dennys – mostly supplied by Tom himself.